We don’t get to see snow too often here in southeast Virginia, but this winter has delivered more than our fair share of snow, sleet, ice and frigid cold temps! My kids have attended school only 3 days in the past 2 weeks because of all the snow and ice. They are thrilled of course but I’m ready for the return of warm sunny days! If you follow me on Instagram or Facebook then you will recognize this top picture I shared yesterday of the snowy beach. So many people commented on their surprise to see snow on the beach so I figured I’d share a few more pics with you today. I need to thank my mom and her friend Diane for sharing most of these photos they took with me. I would love to have captured some myself but the roads have been too hasardous. 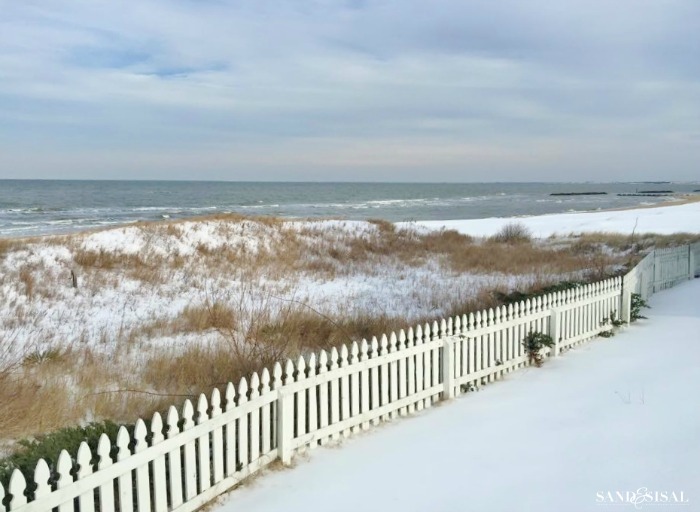 The above photo is the view of the snowy beach and dune from my mom’s lower deck. Our family has enjoyed many lazy summer evenings swinging on the porch swing and watching the waves crash on the shore. All of mom’s grandkids love to run and play in the yard, lined with a charming white picket fence (pictured above). And I can’t even tell you how many frisbees, balls, or toys have been lost and never to be found again in that dune! Isn’t her neighborhood beautiful all awashed in a blanket of white? By Monday all of this pretty white scenery will disappear. 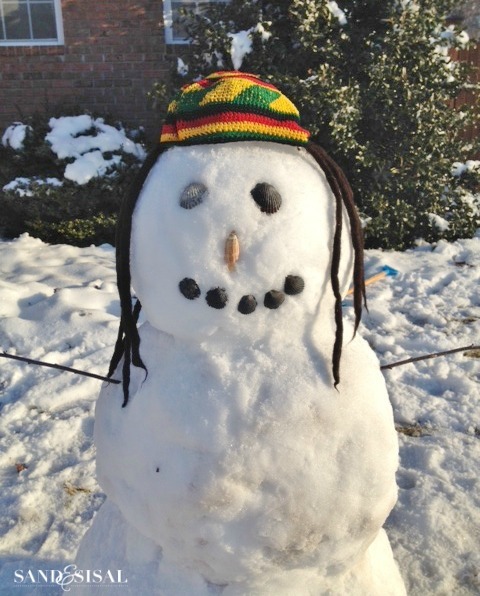 So what should we do with all this snow before it melts?…..Well… do you want to build a snowman? Ours took on a beachy island theme of course, complete with shell eyes, nose and mouth! I hope you enjoyed a glimse of our snowy beach! Have a wonderful weekend friends & stay warm! Just beautiful!!! 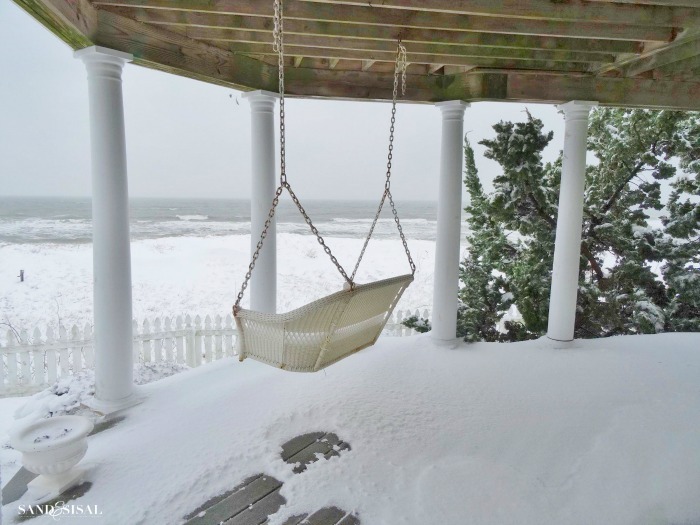 I have never seen snow on the beach. Gorgeous! Thanks for sharing. 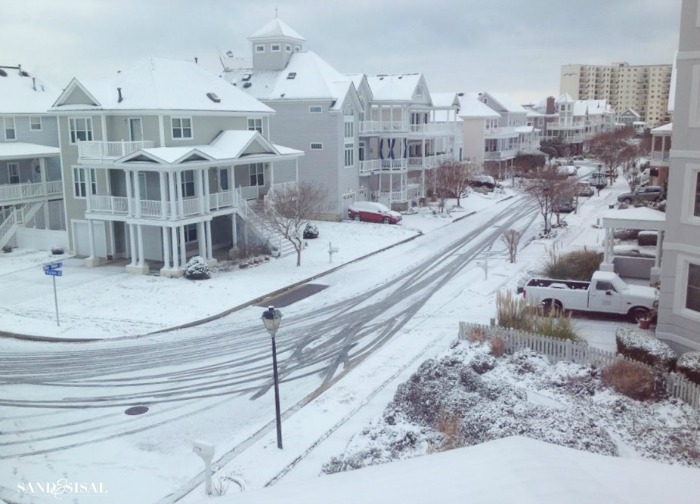 I love these pictures….. we have had no snow in my neck of the woods, so it is fun to see the photos!! The beach is beautiful even in the winter…though I prefer spring, summer and fall! I also live in southeast Virginia (in Northern Va Beach) and all this snow seems a little out of the ordinary for us! I think you got Utah’s snow! We haven’t had any since Christmas, which is very unusual. My daughter and her husband live in Cape Charles. 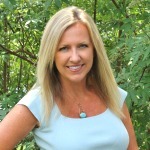 She was missing our Long Island snowy winters, but not this year! We live five minutes from a beach – actually it’s hard not to live very near water on Long Island! – and our three town beaches looks like this every winter. 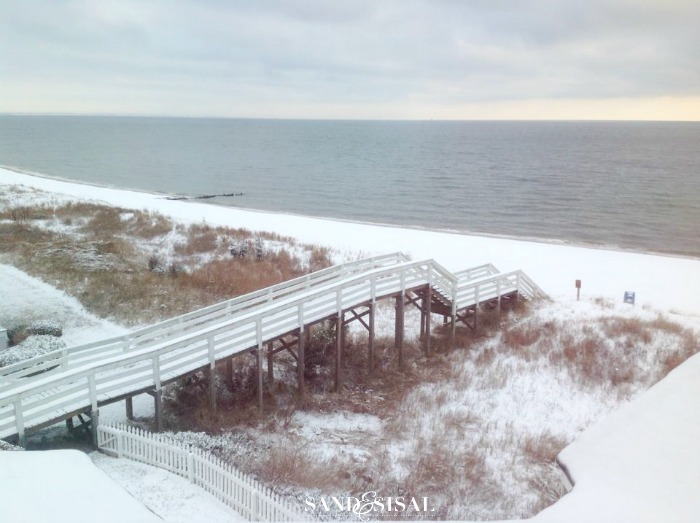 I love your photos – winter beaches are just beautiful. 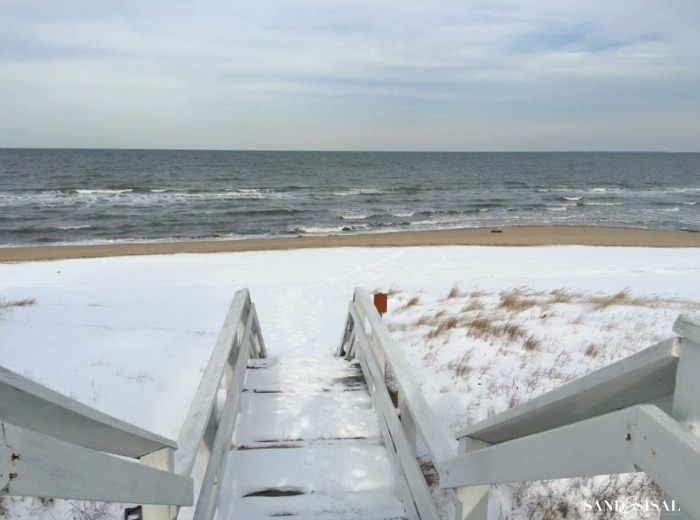 Unfortunately, there’s so much snow on the two-land black top to our beach that we can’t get there to see it, so I’m happy to be looking at your mom’s beach as a lovely alternative! Thanks very much. Great pictures! I live by the seaside and it rarely snows!